Winning and keeping customers used to be entirely about the quality of a product or the service that product could deliver. Nowadays, the customer “game” is played chiefly around customer experience (CX), or more to the point: which organization can offer customers the experience that most deeply resonates. The connected world has come a long way since the limited early-to-mid-2000s communications APIs of basic email connections, SMS aggregation, and call broadcasting. The Internet of 2019 is fluid, and communications are central to all online experiences. Real-time chat during an online shopping session is a great indicator of where things are headed. Easy-to-use APIs are key to this “fluidity” and to a happy (and most importantly, loyal) customer. Communications Platform as a Service (CPaaS) has undergone a remarkable evolution over just the past decade to meet growing consumer demand, with a number of players making it possible for messaging to be shared via such channels as email, voice, push notifications, and SMS. However, with the maturation of the market came a need for even more customization. IDC forecasts the worldwide CPaaS market to grow to $10.9 billion in 2022. This increase is being driven by enterprise demand for mobile enablement, cloud consumption, and differentiated customer experiences. Organizations now see the strategic value of embedded communications. They know it’s not enough to simply offer APIs; in order to engage with customers to any real depth — to make a deep and lasting impression — they must inject more intelligence into APIs. And they must do so with relevance, ease, and pace. Cloud migration has moved from the ideal to the practical to (now) the inescapable. The lion’s share of IT budgets are now committed to cloud solutions. More than three-quarters of businesses are using applications delivered via public cloud, from email, CRMs, and, increasingly, communications. The needs of this “new world” are being met by Avaya’s CPaaS, which allows for drag-and-drop functionality when building standalone applications, business process integrations, or other customization. With Avaya CPaaS, organizations can choose from over 2,000 active applications, take advantage of work done by over 18,000 developers, or develop game-changing apps in house from an extensive API catalog, integrating them into any application, workflow, or current communications system. At a time of great churn and change in workplace demographics, CX is the new battleground, and it can be either a company’s making or its undoing. The “hinge point” of CX is in the ability to adapt to customer demands. Organizations that can find a way to tailor the services they offer to the highly demanding modern consumer — in a scalable manner — can enjoy a competitive edge. Avaya CPaaS has been this important path forward for an increasing number of organizations, big and small. An organization’s comfort level with cloud programming is no barrier to using Avaya CPaaS. In a matter of minutes, any company can set up a free account and get started developing disruptive, game-changing apps. 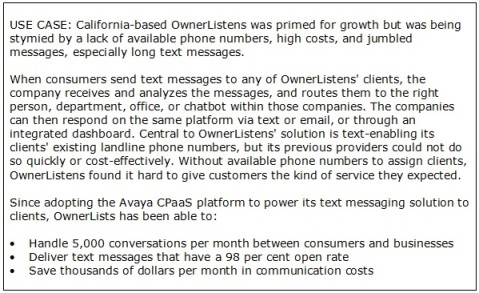 Call 1 866 GO-AVAYA today and ask about Avaya CPaaS.